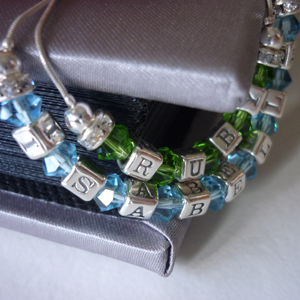 Cute, custom-made sterling silver bracelets perfect for baby, child or adult-sized wrists! They feature sparkly Swarovski birthstone crystals and sterling silver components and make an adorable gift for absolutely any occasion. Please Note: Our birthstone Name Bracelets are made with the utmost of care but be aware they are special-occasion jewellery pieces rather than every-day wear. If worn by a baby or young child and a breakage occurs, the components can become a choking hazard, so please ensure wee ones (under 3 years old) wear their bracelet with adult supervision at all times and that the bracelet is not worn whilst the child is sleeping.